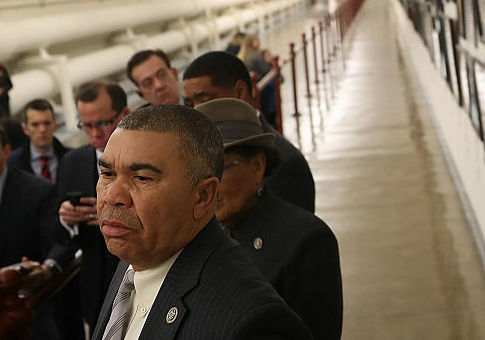 Democratic representative William Lacy Clay Jr. (Mo.) paid the law firm owned by his sister $153,000 in 2017, Federal Election Commission filings show. The money Clay paid to the firm accounted for more than 80 percent of committee's expenditures last year, which has now sent $950,000 to Clay's sister since 2002. Clay Jr. began paying family members from his campaign's coffers almost immediately after entering Congress in 2001. Michelle Clay, his sister, has been the biggest beneficiary of the payments. Michelle Clay is the owner of the Law Office of Michelle C. Clay LLC, a firm located just outside of Washington, D.C. The law office's address appears to be a residential home in Silver Spring, Maryland. Little information is available online about the firm, which does not have a website. Throughout the first three quarters of 2017, Rep. Clay gave $135,000 to the law office. Clay then sent $18,000 to his sister during the fourth quarter, which spans from the beginning of October to the end of December, according to his campaign's latest filings with the Federal Election Commission. The firm pulled in a total of $153,000 throughout the year. Michelle is paid for fundraising, record keeping, compliance, and community organizing, according to the filings. Despite the firm receiving money for fundraising purposes, Clay has also consistently paid Fraioli & Associates, a D.C.-based political campaign consulting group, for fundraising services. Clay's campaign committee raised $248,000 throughout the year and reported spending $185,000, meaning that the $153,000 in payments to his sister's law firm accounts for 82 percent of its disbursements. Clay's campaign did not return a request for comment on the payments. The checks sent to his sister's law firm now total $950,000 since Clay first entered Congress 16 years ago. Michelle's firm is frequently the top recipient of campaign cash from her brother's committee. Clay has paid other family members in the past from his campaign funds. Clay has sent $31,000 to the William J. Clay Scholarship and Research fund, a fund created by his father, Bill Clay Sr., who also served as a congressman for more than 30 years in the St. Louis region. The fund, which awards four full-time scholarships to students, was paid at least $31,000 by Clay's campaign since 2002.